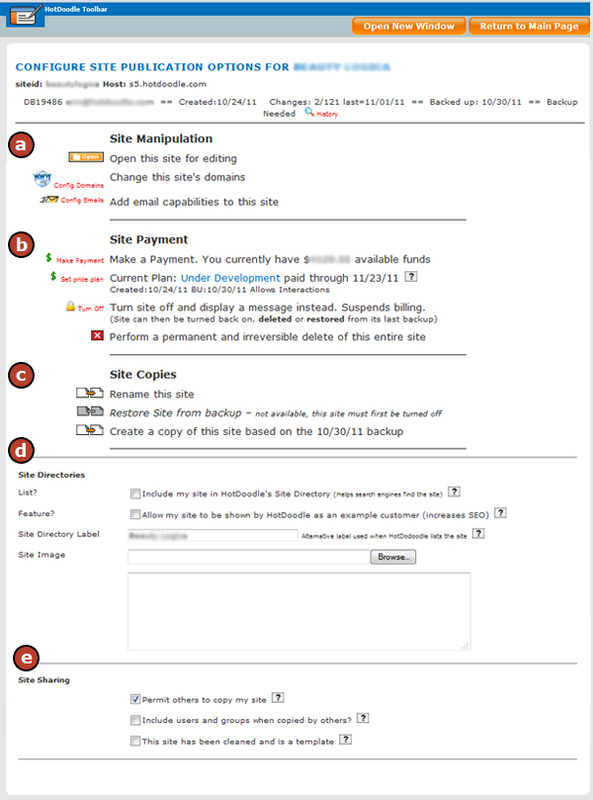 The Site Publication screen is the control panel for all the publication functions for the website. Then the Configure Site Publication Screen Appears. This screen is the big control panel for all publication options for your website. See below for a detailed explanation of each option. Config Domains - This option opens the Domains screen to register a new domain, link an existing domain, or see more information about using already purchased domains. Make Payment - This option opens the Add Funds screen in order to make payments for website hosting and other projects associated with the website. Set Price Plan - This option opens the screen to set up or change the price plan for hosting of the website. Warning: Changing the website hosting to a less expensive price plan may disable portions of the website that require the website to be on a more expensive price plan. Turn Off - This option allows you to turn off your website and suspend billing. Delete - This option performs a permanent and irreversible delete of your website. Rename this site - This option allows the website to be renamed. Create a copy of this site based on the mm/dd/yy backup - This option allows you to create a copy of theweb site, which is useful to build a similar website. List? - This option allows the website to be listed in the HotDoodle Directory, which improves your chances with search engines. Search engines might not find a website if it is not linked from somewhere. Having the website listed will link the website to HotDoodle's main website and this will ensure that search engines find the website. Feature? - This option allows HotDoodle to use the website in examples and advertising. If checked, the HotDoodle team is allowed to show the website as an example on HotDoodle's main website or in advertising, which increases the exposure of the website for search engine purposes as well. Site Directory Label - This option is where the website is named. The name that appears in this field is the name of the website on the My Stuff screen of HotDoodle. This name is internal to HotDoodle and not seen by visitors to the website. Site Image - This option allows an image to be associated with the website, usually a screenshot of the Home page of the website. Permit other to copy my site - This option, if checked, allows others to copy the website. Include users and groups when copied by others/ - This option, if checked, allows copies of the website to include any users and groups existing on the original website to be copied to the new website. This site has been cleaned and is a template - This option is internal for HotDoodle and denotes that aweb site is set up to be used as a template to build other websites from.